The rollout of Tesla’s Gigafactory makes $100 per kwh lithium-ion batteries in electric vehicles possible by 2020. This price point would yield an astonishing $0.11 per kWh electricity storage — or, in other words, allow you to fill up the equivalent of a tank of gas for $9.35. No obstacle to GEV adoption has been as formidable as the development of battery technology. In short, batteries have never been able to compete with the tremendous energy density of petroleum fuels. The last several years, however, have seen enormous strides in battery technology, substantially lowering costs and increasing range potential. This progress has enabled the design and manufacture of grid-enabled vehicles that can compete with the performance and convenience of gasoline-powered cars. In the near-term, it’s clear that hybrid vehicles will become more efficient, that battery production will soar, and that many approaches to deploying plug-in hybrid electric vehicles— such as battery swapping at service stations to avoid waiting while batteries charge, and novel fast-charging approaches—will be explored. These advances have been enabled by recent discoveries in lithium-ion battery science and technology. However, transformational advances in battery science remain a key barrier. Even with the best of today’s technology, batteries that could power a fully-electric vehicle over a driving range of 200 miles before recharging would be simply too large, too heavy, and too costly. The key research challenge is to find new electrochemical energy storage materials that dramatically improve performance; including charging rates, and reduce costs. A key to popularizing electric vehicles will more powerful and more portable batteries, with at least five times the energy capacity for a given weight compared to today’s lithium battery that powers your laptop. But why stop there? The theoretical potential is even higher, a tenfold improvement with new materials, which would make batteries a replacement for gasoline even on long trips. The challenge is new battery electrode materials that haven’t yet been explored, combining structure, composition and surface morphology to enhance their capacity and lifetimes; or else new materials that can store hydrogen at densities greater than liquid hydrogen combined with advanced, low-weight fuel cells that together are, in effect, a novel high-energy battery. The variable costs which influence the market penetration of EVs will be: fuel price, battery cost, electricity costs and market interventions. Of these the battery cost will be both the most significant influence on vehicle price and the one which is least controllable. Battery cost will be determined by a combination of the costs of materials, development, production and shipping, and in the early years there will be limited competition in the sector, driving up prices. As supply increases to match demand and production processes improve with more manufacturers coming to market, prices will reduce. The widespread roll out of EV and PHEV is dependent on advances in battery technology – principally improvements in cost, performance and safety. 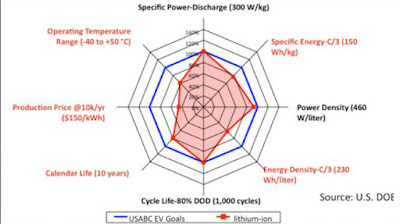 Although nickel metal hydride (NiMH) is currently the dominant battery chemistry for HEV applications, there is a consensus that lithium ion (Li-ion) offers the most promising combination of power and energy density for wider rollout of EV and PHEV. Batteries currently tend to be optimized for high energy, pure EV application or high power, HEV applications. PHEVs must operate as a mixture of the two, which is a challenge for currently-available batteries. The battery sector is confident that this relatively new technology will decrease in price in the medium-long term, based on the massive investments that manufacturers are making in this technology and the falls in the price of mass-manufactured cells for consumer applications. In the short term battery prices are unlikely to fall sufficiently quickly to make pure EVs economically competitive with conventionally-powered vehicles. Navigant reports that 14.6 GWh of advanced batteries was shipped across the global automotive and stationary energy storage sectors in 2015. The majority of the energy capacity was generated in the automotive sector by advanced batteries that were manufactured in Japan. When measured by cell shipments, more than 99% of advanced batteries for the automotive and stationary energy storage sectors were made with Li-ion chemistries in 2015. This is the primary chemistry utilized in new EVs and electrochemical grid-tied ESSs. The global Li-ion manufacturing capacity has expanded in the last several years, as several governments have subsidized factories in Asia Pacific and North America to boost supplies for EVs. The only major application sector with significant market penetration by other chemistries is the stationary energy storage market, where some systems utilize advanced lead-acid batteries, flow batteries, and sodium-metal halide batteries. 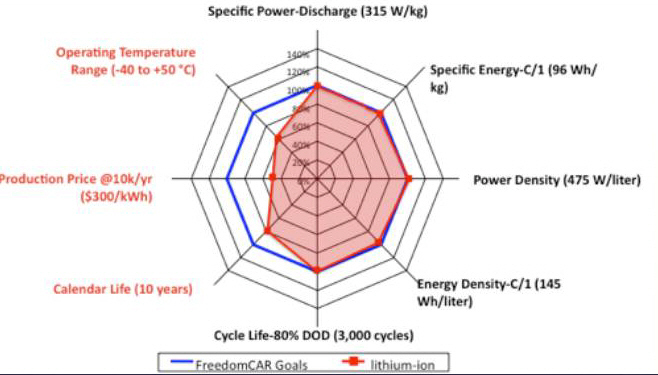 Lead-carbon batteries will be the only sensible choice for micro, mild and full hybrid electric vehicles [HEVs] and many grid connected energy storage applications. Can be manufactured in existing plants without building a new manufacturing, supply chain and distribution infrastructure from the ground up. It can also ramp up to required volumes in years rather than decades. Inexpensive and simple to manufacture. Mature, reliable and well-understood technology - when used correctly, lead-acid is durable and provides dependable service. The self-discharge is among the lowest of rechargeable battery systems. Low energy density - poor weight-to-energy ratio limits use to stationary and wheeled applications. Cannot be stored in a discharged condition - the cell voltage should never drop below 2.10V. Transportation restrictions on flooded lead acid - there are environmental concerns regarding spillage. Thermal runaway can occur if improperly charged. Will probably not be the first choice for plug-in vehicles. Nickel-Metal Hydride (NiMH) - The first chemistry that replaced lead acid in automotive applications was nickel metal hydride (NiMH). NiMH batteries are superior to lead acid batteries in almost every category except for cost. Though more expensive, they offer far better energy density and, therefore, are much lighter for a given amount of required energy. NiMH batteries were used on the previous generation of plug-in vehicles, including the GM EV1, the Toyota RAV4-EV, and the Ford Ranger EV, all sold in California under the original Zero Emissions Vehicle (ZEV) mandates. NiMH batteries continued to be used when HEVs were introduced and can be found in almost all hybrid vehicles currently in production, including the Toyota Prius, the Honda Insight, the Ford Escape Hybrid, the Ford Fusion Hybrid, and the Chevrolet Malibu Hybrid. Simple storage and transportation - transport is not subject to regulatorycontrol. lar full discharge to prevent crystalline formation. nickel-cadmium should be exercised once a month, nickel-metal-hydride once in every 3 months . Lithium-Ion Battery (Li-Ion) - Current lithium-ion batteries are like democracy: They are the worst option, except for all of the other ones. But next-generation technologies like lithium-sulfur and lithium-air batteries still have a long way to go before they're ready for laptops and cars. Lithium-ion is an umbrella term that incorporates several competing battery chemistries, all vying for a niche in the electric vehicle market. Lithium ions move from the anode to cathode during discharge, and from the cathode to the anode when charged. One of the best energy-to-weight ratios, no memory effect, and a slow loss of charge when not in use Not to be confused with lithium batteries, the key difference being that lithium batteries are primary batteries containing metallic lithium while lithium-ion batteries are secondary batteries containing an intercalation anode material. Li-ion batteries sourced from recognized suppliers to the automotive sector, with cost ranging from $1,000 per kWh to $2,000 per kWh, are currently too expensive by at least a factor of two compared to that needed to fulfill the requirements of most pure EV deployment scenarios. There is a growing consensus that Li-ion batteries offer the most promising combination of energy storage capacity with power. While new models due to be launched in 2009 such as the next version of the Toyota Prius and a new Honda hybrid will still use NiMH, subsequent discussion will focus on Li-ion technology. High energy density - potential for yet higher capacities. Deliver the same power with less weight, less volume, and greater efficiency over nickel metal hydride batteries found in today’s hybrids Does not need prolonged priming when new. One regular charge is all that's needed. Compared to NiMH batteries, lithium-ion batteries are more durable and space-efficient. More resistant to changes in temperature, which improves cycle life. Li-Ion batteries, supplied by LG Chem, will be used in GM’s Chevrolet Volt. The Volt, scheduled to be launched in late 2010, will be the first mass-producedextended-range electric vehicle. Not fully mature - metals and chemicals are changing on a continuing basis The manufacturing processes used for Li Ion batteries for automobiles are quickly becoming mature - they represent improvements but not radical changes to techniques used in batteries for consumer electronics. We cannot expect significant increases in performance absent fundamentally new approaches. Trickle charging is not acceptable for lithium batteries; Li-ion chemistry cannot accept an overcharge without causing damage to the cell, possibly plating out lithium metal and becoming hazardous. Most manufacturers claim a maximum and minimum voltage of 4.23 and 3.0 volts per cell. Taking any cell outside these limits can reduce the cell's capacity and ability to deliver full rated current. Most dedicated lithium polymer chargers use a charge timer for safety; this cuts the charge after a predefined time (typically 90 minutes). A lithium–titanate battery is a modified lithium-ion battery that uses lithium-titanate nanocrystals on the surface of its anode instead of carbon. This gives the anode a surface area of about 100 square meters per gram, compared with 3 square meters per gram for carbon, allowing electrons to enter and leave the anode quickly. This makes fast recharging possible and provides high currents when needed. A disadvantage of lithium-titanate batteries is that they have a lower inherent voltage (2.4 V), which leads to a lower specific energy of about 30-110Wh/kg than conventional lithium-ion battery technologies (which have an inherent voltage of 3.7 V). Lithium-Ion Polymer Batteries - Technologically evolved from lithium-ion batteries. Ultimately, the lithium-salt electrolyte is not held in an organic solvent as in the lithium-ion design, but in a solid polymer composite. The advantages of Li-poly over the lithium-ion design include lower cost manufacturing and being more robust to physical damage. Lithium-ion polymer batteries started appearing in consumer electronics around 1996. Flexible form factor - manufacturers are not bound by standard cell formats.With high volume, any reasonable size can be produced economically. ALABC - Advanced Lead-Acid Battery Consortium, Durham, NC - An international research consortium comprised of lead producers, battery manufacturers, equipment suppliers, research organizations and other pertinent entities organized to enhance the performance of lead-acid batteries for a variety of markets, including hybrid electric vehicle (HEV) applications. Cycle - The discharge and subsequent or proceeding charge of a rechargeable battery such that it is restored to its original conditions. Cycle Life - The number of charge / discharge cycles a rechargeable battery can perform before capacity drops below 60% of rated capacity. HTMI - High-Temperature Melt Integrity Lithium-ion Battery Separators - One of the concerns associated with the use of lithium-ion batteries in PHEV’s is the possibility of an internal short-circuit, caused by the shrinkage of the separator at high temperatures. Advanced Lithium-ion battery separators with improved melt integrity and improved safety will be required. Li-Ion - Lithium-Ion Battery - A family of rechargeable battery types in which lithium ions move from the negative electrode to the positive electrode during discharge, and back when charging. Chemistry, performance, cost, and safety characteristics vary across LIB types. Unlike lithium primary batteries (which are disposable), lithium-ion electrochemical cells use an intercalated lithium compound as the electrode material instead of metallic lithium. Lithium Titanate Batteries - Type of rechargeable battery, which has the advantage of being faster to charge than older Lithium-ion batteries. Offer high charge and discharge rates and are in trial use as moderators for grid power on a small scale.. Some analysts speculate that Lithium-titanate batteries will power electric cars of the future. The Lightning GT, a recently announced all-electric sports car, will use the Altair Nanotechnologies' Nanosafe Lithium-titanate battery. mAh - Milliamp-Hours - Product of current (mA), multiplied by time (in hours) the circuit is closed (current flowing). Self Discharge Rate -The rate at which a cell or battery loses its charge when idle. Silicon Sponge - Researchers at Pacific Northwest National Laboratory (PNNL) have developed a “mesoporous silicon sponge” material that, when applied as an anode in a lithium-ion battery, can deliver capacity of up to ~750 mAh g−1 based on the total electrode weight with more than 80% capacity retention over 1,000 cycles. This porous, sponge-like nanomaterial made of silicon that could help lithium-ion batteries run longer by giving the batteries' electrodes the space they need to expand without breaking. This means that the lithium-ion batteries that power electric vehicles could store more energy and run longer on a single charge with the help of a silicon sponge. As silicon has more than 10 times the energy storage capacity of graphite, the porous material will replace the graphite traditionally used in one of the battery's electrodes. Silicon has long been sought as a way to improve the performance of lithium-ion batteries, but silicon swells so much when it is charged that it can break apart, making a silicon electrode inoperable. The drawback is that silicon expands as much as three times in size when it charges, creating pressure within the material that causes it to break. While scientists have attempted to make nano-sized battery components, hoping the smaller size would give the silicon enough room to expand, these efforts have fallen short on producing market-ready technologies. Specific Power - Power-to-weight ratio, measured in watts per kilogram. The result offers an approximation of the peak-power output of an engine. Plug-in Electric Drive Vehicle Credit Final Act - Estimates $2 billion - The bill modifies and increases a tax credit passed into law at the end of the 2008 Congress for plug-in electric drive vehicles placed in service during the year. The base amount of the credit is $2,500. If the qualified vehicle draws propulsion from a battery with at least 5 kilowatt hours of capacity, the credit is increased by $417, plus another $417 for each kilowatt hour of battery capacity in excess of 5 kilowatt hours up to 16 kilowatt hours. Taxpayers may claim the full amount of the allowable credit up to the end of the first calendar quarter in which the manufacturer records its 200,000th sale of a plug-in electric drive vehicle. The credit is reduced in following calendar quarters. The credit is allowed against the alternative minimum tax. The bill also restores and updates the electric vehicle credit for plug-in electric vehicles that would not otherwise qualify for the larger plug-in electric drive vehicle credit and provides. UltraBattery - A hybrid energy/storage device, which combines an asymmetric capacitor and a lead-acid battery in one unit cell, without extra electronic control. USABC – United States Advanced Battery Consortium - Established in 1991 by the three biggest American automakers (Chrysler, Ford, and GM) to accelerate the development of battery technology for Electric Vehicles (EVs). USABC is a consortium of the United States Council for Automotive Research LLC (USCAR). In 2012, lithium ion batteries for cars cost around $900 per kilowatt hour. In 2013, Two years ago, Navigant Research estimated that battery-pack costs would hit $180/kWh by the end of the decade. And a 2014 study in Nature Climate Change pegged battery-pack costs at about $300/kWh. In October 2015, GM recently showed a slide that said that its lithium-ion battery costs are down to about $145 per kilowatt hour, Hybrid Cars says, citing comments General Motors made at its Global Business Conference in Michigan. The company also showed that these costs may drop to $100/kWh by 2021. Tesla Motors has said it'd hit those cost levels in 2020, and Tesla is not outsourcing the job like GM is (LG Chem makes the cells for the 2015 Spark EV and the Chevy Volts) . New electrochemical materials that enable “fast charge” are now being explored. The focus of much of the battery industry is on producing batteries with high energy and power at a cost most consumers will find compelling. The primary drivers of battery cost are high material costs and lack of scale. Smart Grid infrastructure can also facilitate new business models that encourage PHEV adoption. One example that has been theorized is the concept of battery leasing, in which a leessor (the vehicle manufacturer or a third party) would own the batteries of a PHEV. Since battery cost constitutes much of the incremental cost of PHEVs compared to conventional vehicles, the capital cost to consumers of PHEVs would be reduced, which would stimulate PHEV sales and market penetration. A Smart Grid infrastructure would recognize the charging “signature” of a PHEV and attribute a differentiated rate for PHEV kilowatt-hour sales. This special rate would provide a margin beyond the standard utility rate to serve as a stream of lease payments to the lessor to cover battery costs over time. The economic viability of such a model is yet to be determined, but the technical possibility underscores how a Smart Grid can facilitate PHEV market penetration. Room to Improve - The actual capacities of existing battery cells are still fall far below their theoretical values, for the active materials in widespread use (Mn and PO4-based cathodes). That tells us that in order to get to the theoretical values, we do need to execute higher-risk, but higher-payoff, cell designs and manufacturing technologies which unlock their full potential and reduce the cost of production. Financial Certainty - The price of oil is very volatile due in part to geopolitical disruption. The cost of operating an EV is much more stable. Reuse - There is no denying how cost-intensive battery packs are for manufacturers of electric vehicles. A possible strategy for defraying those costs would involve giving them a second, stationary life as backup power for the electrical grid. Several re-use experiments are under way, including two backed by General Motors and Nissan. Also working on the issue is a consortium of universities and nonprofit groups that is preparing to use E.V. batteries as part of a renewable energy “microgrid” at the University of California, San Diego. On paper, it looks like modest but positive reductions are possible to bring down the cost of a hypothetical Chevrolet Volt battery lease as much as 20 percent through the residual value in their used packs,” said Brett Williams, a senior researcher in electric drive energy at the University of California, Berkeley. Cost - the experience curve rationale mainly applies to cells, where there is room for optimisation of production through automation – providing quality can be maintained. The balance of the battery system (module and battery assembly) requires considerably manual intervention and is likely to follow different cost reduction paths. It is clear that considerable cost reductions for cells will ensue in mass production, based on the experience of the manufacture of cells for consumer applications. Self-Discharge - All batteries are affected by self-discharge. Self-discharge is asymptotical; the highest loss occurs right after charge, and then tapers off. Nickel-based batteries exhibit a relatively high self-discharge. Higher temperature increases the self-discharge substantially. As a general guideline, the rate of self-discharge doubles with every 10°C (18°F) increase in temperature. The self-discharge of nickel-metal-hydride is about 30% higher than that of nickel-cadmium. The self-discharge increases after a NiMH battery has been cycled for a few hundred times. The battery plates begin to swell and press more firmly against the separator. Metallic dendrites, which are the result of crystalline formation (memory), also increase the self-discharge by marring the separator. Discard a nickel-based battery if the self-discharge reaches 30% in 24 hours. The self-discharge of the lithium-ion battery is 5% in the first 24 hours after charge, and then reduces to 1% to 2% per month thereafter. The safety circuit adds about 3%. High cycle count and aging have little effect on the self-discharge of lithium-based batteries. A lead-acid battery self-discharges at only 5% per month or 50% per year. Repeated deep cycling increases self-discharge. Battery Life - The current average life of vehicles is 14 years. Battery life for EVs and PHEVs is projected to reach ten years and 180,000 km; however current expectations over battery life and range are much lower. This presents the possibility of battery replacement during the life of the vehicle to ensure its continued use and brings with it significant additional cost. Given that most popular cars lose 50-60% of their purchase price after 3 years, the cost of a replacement battery is likely to exceed the value of the car, possibly leading to premature scrappage of the vehicle. Deep Discharge/Overcharge - The cycling of lithium-ion batteries is most detrimental to their health when they are deeply discharged; that is, when their energy is so completely depleted the remaining state of charge of the battery is very low. Alternatively, battery health is also severely damaged when the battery is held at a very high state of charge for long periods of time. At a practical level, the deleterious effects of deep cycling and overcharging result in a rapid reduction of usable battery capacity. In an electric vehicle, this would effectively shorten the range of the car and ultimately cut short the calendar life of the battery. To mitigate this effect, automakers are integrating into their batteries a reserve portion at the low end of the state of charge and sometimes an additional reserve portion at the high end of the state of charge. The reserve portion at the low end prevents the battery from ever being fully discharged. The reserve portion at the high end prevents overcharging. Over-Specification - To combat cycling issues, the 16 kilowatt hours of energy capacity in the Chevrolet Volt, the actual used capacity will only be approximately 50 percent (8 kWh), because the battery only cycles from a maximum 80 percent state of charge down to a minimum 30 percent state of charge. This extra capacity is designed to achieve the vehicle’s target life of 10 years and 150,000 miles. Over-specifying battery energy density adds significantly to total battery cost. 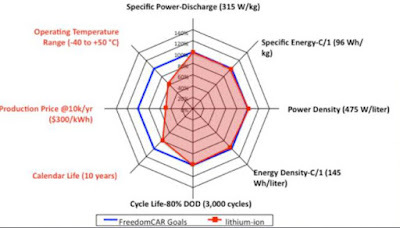 Having a real-world understanding of how the battery will behave over time and over different cycle profiles will be critical in order to minimize the amount of over-specification required to protect the battery’s health. Vehicle Leasing - The high capital cost of the battery combined with the uncertainly about the battery life, reliability and obsolescence means that it is currently difficult to predict residual values for EVs and PHEVs. The vehicle and battery may also have different life expectations. The issue of leasing would be further complicated if the battery and vehicle were separated, as a battery without a chassis may be considered worthless and vice versa. This presents a situation where residual values cannot be predicted due to lack of in-service data for vehicles, and manufacturers are unable to get vehicles in to the market because of a lack of leasing arrangements. Current EVs are sold using various packages. These include complete purchase, purchase of vehicle and lease of battery, and combined lease of vehicle and battery. leading to the cell going into thermal and/or electrochemical runaway and exhibiting unacceptable behavior. Domestic Manufacturing – High tech batteries are made in Asia. The Electric Drive Battery and Component Manufacturing Initiative is aimed at “supporting the construction (including production capacity increase of current plants), of U.S. based manufacturing plants” for EV batteries and components. Lithium-ion Battery Safety - The currently-prevalent nickel and cobalt-based oxide Li-ion cathode materials such as NCA have potential issues with overcharging. Exothermic reactions can lead to the ‘thermal runaway’ (continued heat evolution even after the overcharging is ceased) . Voltage control at cell, module and battery level is critical to prevent overcharging of automotive Li-ion batteries – all factors that will inevitably increase Li-ion battery cost relative to alternatives. Lithium iron phosphate cathodes offer a promising future alternative chemistry that avoids much of this problem and is a promising near-term Li-ion chemistry for wider EV deployment. The potential consequences of overcharging can be alleviated by electrode separators that melt at excessive temperatures to ‘shut down’ the cells, and improved formulations to minimize metallic lithium formation at the anode. There has been adverse publicity in recent times concerning the safety of Li-ion batteries, particularly in personal electronic applications. However, over 200 Li-ion equipped electric and hybrid vehicles were road tested in California, Europe and Japan from 2002 - 2007, with no reported significant safety problems. Lithium Battery Recycling - There is currently little economic need to recycle lithium-ion batteries. Most batteries contain only small amounts of lithium carbonate as a percentage of weight and the material is relatively inexpensive compared to most other metals. The DOE has granted $9.5 million to Anahiem based Toxco that plans to build America's first recycling facility for lithium-ion vehicle batteries. Toxco says it will use the funds to expand an existing facility in Lancaster, OH, that already recycles the lead-acid and nickel-metal hydride batteries used in today's hybrid-electric vehicles. Reducing costs by achieving economies of scale. While research and development is critical to advancing emerging technologies such as batteries that still face formidable technical challenges, at some point (meaning now), the DOE should tilt the balance towards commercial projects. This could help the U.S. to close the distance in the race to provide batteries for the upcoming generation of plug-in hybrid and all electric vehicles. Boston Power - Westborough, MA- Creating a next-generation lithium-ion battery technology platform. Headquartered in Massachusetts with mass manufacturing operations in Asia. The company is funded by venture capital firms Foundation Asset Management, Oak Investment Partners, Venrock Associates, GGV Capital, and Gabriel Venture Partners. In Dec 2015, XG Sciences and Boston-Power announced a joint development program aimed at customizing XG Sciences’ silicon-graphene anode materials for use in Boston-Power’s next-generation lithium-ion battery cell products. Celgard, Charlotte, NC – World leader in separator technology offering excellent energy and power performance, dimensional integrity, and chemical and thermal stability in lithium battery applications. EnerDel - Indianapolis, IN -Formed in 2004 through a collaboration of industry leaders: Ener1, Delphi Corporation and Itochu Corporation. Headquartered in New York, Ener1 pursues multiple alternative energy applications through its three wholly-owned subsidiaries, EnerDel, Enerfuel and NanoEner, and its 89%-owned South Korea-based subsidiary, Enertech. Designs, builds and manufactures lithium-ion energy storage solutions and battery systems with a focus on heavy duty transportation, on- and off-grid electrical, mass transit and task-oriented applications. The company was the first in the U.S. to mount commercial-scale production of large-format, prismatic, lithium-ion battery packs. EnerDel currently has two facilities in the Indianapolis area, as well as a manufacturing facility in Korea. EnerDel’s product suite delivers energy-dense solutions for both high-power and high-energy applications, including one of the highest energy-dense cells in the industry. Envia Systems - Newark, California - In February 2012 announced what it called a “major breakthrough” in lithium-ion cell technology that would result in a significant increase in the energy density — and a sharp reduction in the cost — of lithium-ion battery packs. Envia is financed by the Energy Department and G.M. Ventures, the venture-capital arm of General Motors, as well as other investors. Envia’s announcement said that its packs would deliver cell energy of 400 watt-hours per kilogram at a cost of $150 per kilowatt-hour. Though it doesn’t disclose a cost breakdown, Tesla Motors rates the energy density of its Roadster’s pack at 121 watt-hours per kilogram. Leyden Energy - Fremont, CA - Produces lithium-ion batteries with an electrolyte based around a family of salts called IMIDE. Most other batteries use PF6-based electrolytes. Claims it can improve performance, reduce costs and boost safety by changing some of the basic ingredients in batteries. Sakti3 Ann Arbor MI - Trying to create ,higher-risk, but higher-payoff, solid state battery cell designs and manufacturing technologies which unlock their full potential and reduce the cost of production. Seeo - Berkeley, CA - Taking a novel approach to solid electrolytes. developing a new generation of rechargeable lithium batteries with unprecedented energy density, lifetime, and safety. Leapfrogging existing performance and cost standards. Toshiba - announced the commercial launch of the SCiB—the Super Charge ion Battery in December 2007. It is a fast-charging battery that offers excellent safety and a long-life cycle of over 10 years, even under conditions of constant rapid charging. According to Toshiba, the safety characteristics of SCiB allow recharge with a current as large as 50 amperes (A), allowing the SCiB Cell and SCiB Standard Module to recharge to 90% of full capacity in only five minutes. Battery University –An on-line resource that provides practical battery knowledge for engineers, educators, students and battery users alike. The papers address battery chemistries, best battery choices and ways to make your battery last longer. Science Direct - Batteries: Higher energy density than gasoline? - Michael Fischera, Mathew Werbera and Peter V. Schwartz, Cal Poly Physics Department, San Luis Obispo - The energy density of batteries is two orders of magnitude below that of liquid fuels. However, this information alone cannot be used to compare batteries to liquid fuels for automobile energy storage media. Because electric motors have a higher energy conversion efficiency and lower mass than combustion engines, they can provide a higher deliverable mechanical energy density than internal combustion for most transportation applications. The new Nano technology batteries from A123 Systems and Altair Nanotechnologies makes a new type of bus system feasible. These batteries can be charged very quickly (<10min)DE-FOA-0000026 entitled "Recovery Act - Electric Drive Vehicle Battery and Component Manufacturing Initiative." Application were due May 2009. Vinod Khosla on the Future of Lithium-Ion Batteries and Energy Storage Khosla thinks that lithium ion battery making is going to be competing in an overheated, nearly-commoditized market and will probably not get down the cost curve in the next 5 years. He points out longer term forecasts are futile because so called experts can make anything they want up -- we all know long term we will all be on fusion power! Slide-show that Patrick T. Moseley PhD, the president of the Advanced Lead-Acid Battery Consortium [ALABC], presented at the conference. While I've known about the surprising gains that come from the integration of advanced carbon materials into conventional lead-acid batteries for several years, the Moseley presentation is one of the first public documents to explore the details.